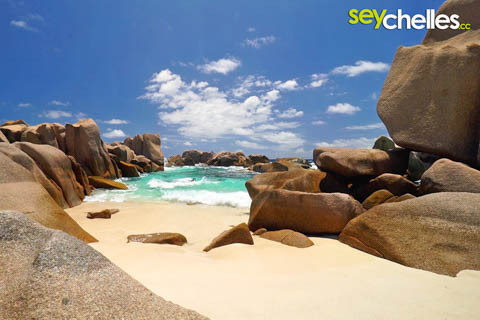 Anse Marron is a remote beach on the very southern tip of La Digue. The path here is not easy to find and after trying 2 times from two different sides, we ourselves decided to take a guide. 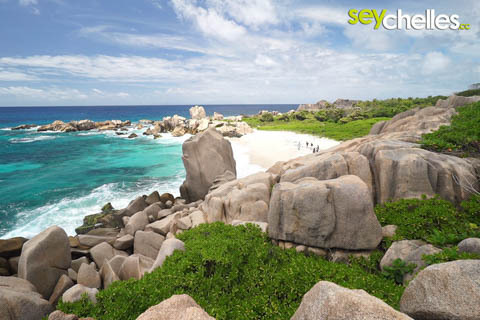 The remoteness of this place along with the amazing granite blocks makes this beach and the trip one of the must-sees on La Digue. Our images don´t do justice to Anse Marron, they are just screen-grabs from the video of our Trail with Robert Agnes. We plan better images for our next visit. The granites on Anse Marron form a nice big bathtub for swimming and bathing. Something that´s rather rare on this beach though is shadow, so be prepared.